This 100mL acrylic burette is graduated and screen printed in black to Class B accuracy. Transparent and break resistant, it is suitable for use in education, research or industrial laboratories--especially where breakages often occur. This series is unaffected by most dilute aqueous solutions (except ammonia and HF), but unsuitable for ethanol or organic solvents. Lengths and internal dimensions can vary, as all are individually calibrated. Capacity: 100mL. Dynalon #: 564715-0100. 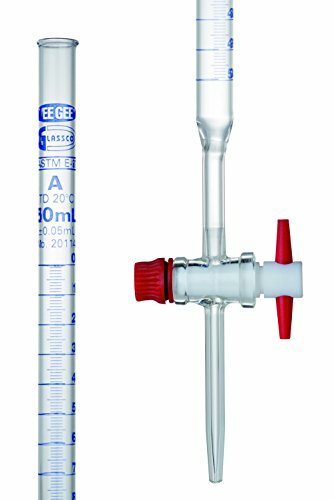 'Burette, Material of Construction Borosilicate Glass Burette, Polyethylene Screw Cap, Base and Bottle, Capacity 25mL Burette w/ 500mL ReservoirGraduation Subdivisions 0.1mLClass AStopcock Material Bore Glass Stopcock, Special Features Closed System Avoids Outside Contamination' Research, industrial and healthcare professionals rely on SP Scienceware for their sample handling needs. Sold worldwide, Bel-Art and H-B Instrument brand laboratory supplies include over 5,000 items from safety wash bottles to fume hoods, thermometers, racks, desiccators, hydrometers, ice buckets, scoops and spoons. Custom calibration services, plastic molding, specialty coatings and wire manufacturing are also available. Wilmad-LabGlass brand laboratory glassware complements Bel-Art and H-B Instrument with over 7000 items including NMR and EPR consumables and specialty glassware, as well as custom fabrication for individual glassware, glass repair services and OEM glass parts. SP Scienceware is a division of Warminster, PA based SP Industries which also include SP Scientific laboratory, thermal management, and pharmaceutical production equipment and SP Ableware aids for daily living. This buret has a clear acrylic body and leakproof stopcock with a self lubricating PTFE plug. Each buret is individually calibrated for maximum accuracy. Acrylic body is resistant to dilute mineral acids and bases except Hydrofluoric Acid and Ammonium Hydroxide. It can be used with pHs ranging from 1 to 14 and with up to 5% weight per weight of acids or 30% of bases. Graduations are at 0.1ml. Number of Items:1 Number of Items:1 Burette, Material of Construction Borosilicate Glass Burette, Polyethylene Screw Cap, Base and Bottle, Capacity 10mL Burette w/ 500mL ReservoirGraduation Subdivisions 0.1mLClass AStopcock Material Bore Glass Stopcock, Special Features Closed System Avoids Outside Contamination Research, industrial and healthcare professionals rely on SP Scienceware for their sample handling needs. Sold worldwide, Bel-Art and H-B Instrument brand laboratory supplies include over 5,000 items from safety wash bottles to fume hoods, thermometers, racks, desiccators, hydrometers, ice buckets, scoops and spoons. Custom calibration services, plastic molding, specialty coatings and wire manufacturing are also available. Wilmad-LabGlass brand laboratory glassware complements Bel-Art and H-B Instrument with over 7000 items including NMR and EPR consumables and specialty glassware, as well as custom fabrication for individual glassware, glass repair services and OEM glass parts. SP Scienceware is a division of Warminster, PA based SP Industries which also include SP Scientific laboratory, thermal management, and pharmaceutical production equipment and SP Ableware aids for daily living. This quick, convenient buret setup contains all the necessary equipment and is more cost-effective than purchasing the items individually. Includes a 50 _ 0.1-mL glass buret, a medium-size support stand with rod, and a buret clamp with coated jaws. The student-grade buret has a PTFE stopcock for long use. The base on the support stand is 5 _ 8" and the rod measures 20 _ 3/8". The clamp opens from 3/8 to 1 3/8" and fits rods up to 1/2" in diameter. Burette, Material of Construction Borosilicate Glass Burette, Polyethylene Screw Cap, Base and Bottle, Capacity 25mL Burette w/ 1000mL ReservoirGraduation Subdivisions 0.1mLClass AStopcock Material Bore Glass Stopcock, Special Features Closed System Avoids Outside Contamination Research, industrial and healthcare professionals rely on SP Scienceware for their sample handling needs. Sold worldwide, Bel-Art and H-B Instrument brand laboratory supplies include over 5,000 items from safety wash bottles to fume hoods, thermometers, racks, desiccators, hydrometers, ice buckets, scoops and spoons. Custom calibration services, plastic molding, specialty coatings and wire manufacturing are also available. Wilmad-LabGlass brand laboratory glassware complements Bel-Art and H-B Instrument with over 7000 items including NMR and EPR consumables and specialty glassware, as well as custom fabrication for individual glassware, glass repair services and OEM glass parts. SP Scienceware is a division of Warminster, PA based SP Industries which also include SP Scientific laboratory, thermal management, and pharmaceutical production equipment and SP Ableware aids for daily living. Used for titration in labs for years, these have found some new uses in other areas. 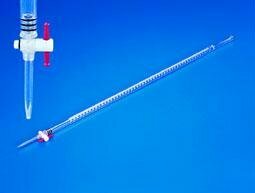 Burettes are generally used to accurately dispense oils and liquids. Also, many engine builders use these to match cylinder heads for high performance engine building. This is a borosilicate glass tube body with 0.10mL subdivisions and accurate to + or - 0.10 ml (cc) for the 50mL. Each buret one has a borosilicate glass tube body with a straight PTFE Traditional style stopcock. This stopcock reduces breakage, turns more freely than glass, and is designed for conditions ranging from general purpose to high vacuum. Also known as Geissler Burets. Capacity 50 ml. Accurately graduated, with white engraved markings, with fitted straight bore glass leak proof stopcock with capillary jet. Thick wall construction. Made from Borosilicate Glass. 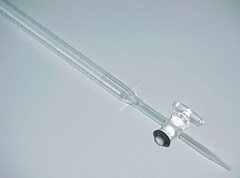 Kimax 50mL Schellbach buret with a filling tube at the stopcock and an overflow tube at the top of the buret that accepts " I.D. flexible tubing. Stopcock for all sizes is standard 2mm bore. Scale is durable black ceramic enamel. Replacement stopcock is S6445. Kimble #: 17170F-50. 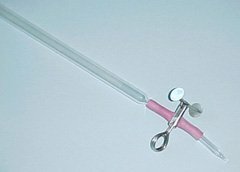 Economical burettes are supplied with 2mm straight bore PTFE stopcock plugs. Ideal when accuracy of the Class A model is not critical. Microfinish of the barrel provides a precision fit. Tips are carefully drawn for accuracy to insure proper drainage rate. Dust cover included. Features durable colored markings. 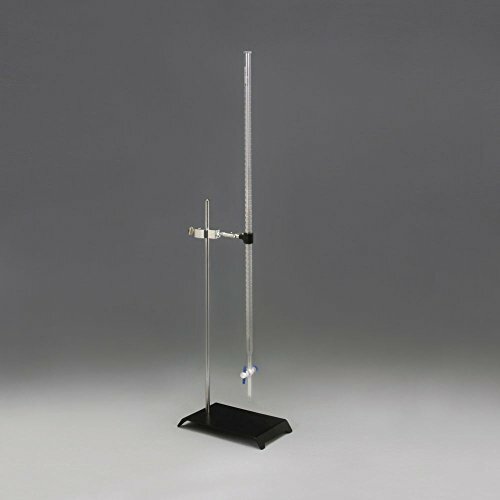 This 50mL acrylic burette is graduated and screen printed in black to Class B accuracy. Transparent and break resistant, it is suitable for use in education, research or industrial laboratories--especially where breakages often occur. This series is unaffected by most dilute aqueous solutions (except ammonia and HF), but unsuitable for ethanol or organic solvents. Lengths and internal dimensions can vary, as all are individually calibrated. Capacity: 50mL. Dynalon #: 564715-0050. 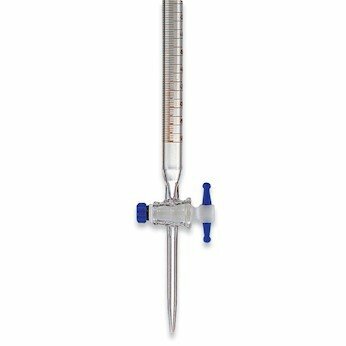 This 25mL acrylic burette is graduated and screen printed in black to Class B accuracy. Transparent and break resistant, it is suitable for use in education, research or industrial laboratories--especially where breakages often occur. This series is unaffected by most dilute aqueous solutions (except ammonia and HF), but unsuitable for ethanol or organic solvents. Lengths and internal dimensions can vary, as all are individually calibrated. Capacity: 25mL. Dynalon #: 564715-0025.